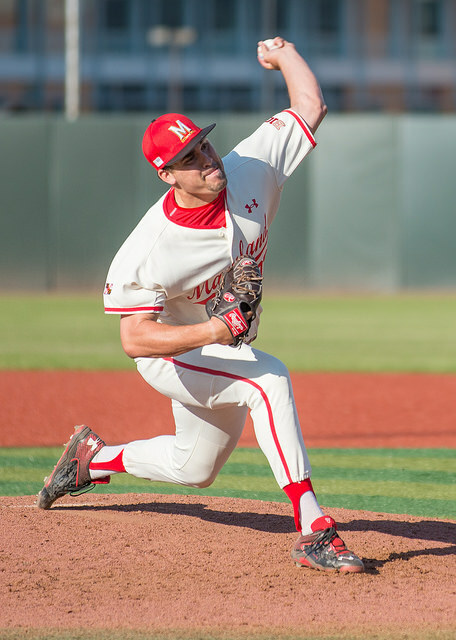 Maryland LHP Zach Morris was selected by the Philadelphia Phillies in the 24th Round of the 2015 MLB Draft Wednesday. Morris is the fourth member of the Terps bullpen to be picked in this year’s draft. Morris excelled in his first full season in the bullpen in 2015, pitching to a 2.61 ERA over 31 innings. The 6-foot-5 inch lefty only walked eight batters all season and turned in a shutout relief outing against No. 1 UCLA in his final game. The Edgewater, Maryland native made 19 starts over his first two seasons and experienced success in that role. He led the Cincinnati Bearcats in ERA in 2012 before transferring to Maryland and redshirting in 2013. Morris posted a 2.77 ERA over 39 innings in 2014, earning a spot in the Cape Cod League for the Brewster Whitecaps. This is the first time Morris has been drafted. His brother, Justin was drafted by the Arizona Diamondbacks last year, but elected to play with Zach and the Terrapins. The Morris brothers both attended DeMatha Catholic High School in Hyattsville, Maryland. DeMatha has a long history of producing pro athletes such as Derek Mills, Sidney Lowe, Danny Ferry, Adrian Branch, Jerian Grant, Victor Oladipo, Brett Cecil and Brian Westbrook. Morris is the eighth Terp picked in this year’s draft, which extends a school record. He’ll have until July 17 to strike a deal with Philadelphia, or he’ll return to College Park to fulfill his fifth and final year of eligibility. after launching it generally within the U.S. and U.K. previous this month. and video yet, individuals need a connect-in installation).